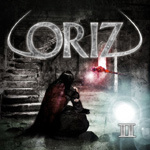 Alexander Oriz from Huskvarna, Sweden, formed his own band ORIZ in late 2009. The others in the band are guitarist David Mauritzon, vocalist Mattias Eriksson, drummer Emil Eriksson, and bassist Christopher Davidsson. The music is said to be heavily influenced by the seventies and eighties, and bands like DEEP PURPLE, RAINBOW and WHITESNAKE, plus the newer bands like JORN and GOTTHARD. They debuted in 2010 with a self titled album, but on a very small label. “II” was mastered by Micke Lind (DIO, TALISMAN), and big things are promised. The album is quite laden with keyboards, and of cause Alexander gets the opportunity to play solos. The refrains are in focus, of cause, and there are plenty of choruses. Te structures and arrangements are totally in the classic vein, but alas, only opener “Forever Free” with its mix of modern and classic hard rock and “Your Lies”, complete with remarkable lyrics, are representatives of good hard rock. The rest are hampered by sometimes very inferior vocals and often lame refrains. The song material is derivative and basic, which shouldn´t happen in the classical hard rock genre. Unfortunately for ORIZ this album does not qualify them for pride and glory.